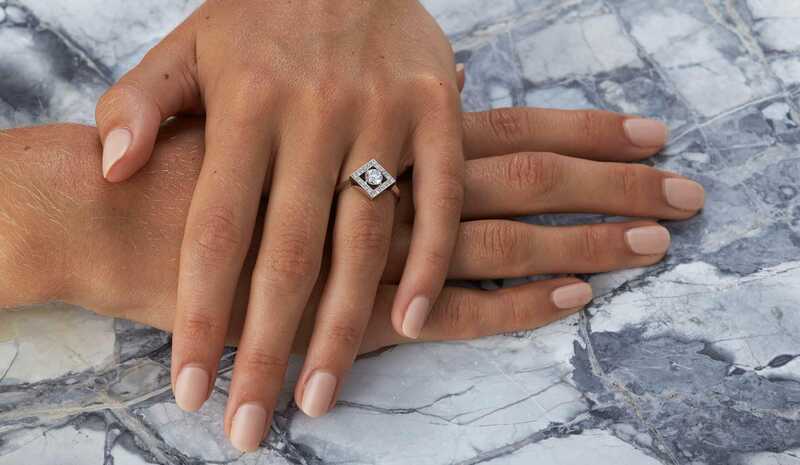 The elegant form of the Amavi Engagement Ring represents the ways in which we navigate through life, the points of the compass, the seasons and the four elements. The Amavi Engagement Ring is set with a central diamond that is delicately framed by a square with 20 grain set round brilliant cut diamonds. This elegant form represents the ways in which we navigate through life, the points of the compass, the seasons and the four elements. The pointed edge of the setting perfectly transitions into the sword edge band. These delicate details makes this a fresh take on the classic solitaire engagement ring. "Zoe was a dream to work with, we absolutely loved what she did and we will treasure our rings forever and ever!."